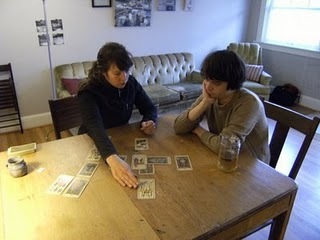 Description of image: Two mason jars stand side-by-side. 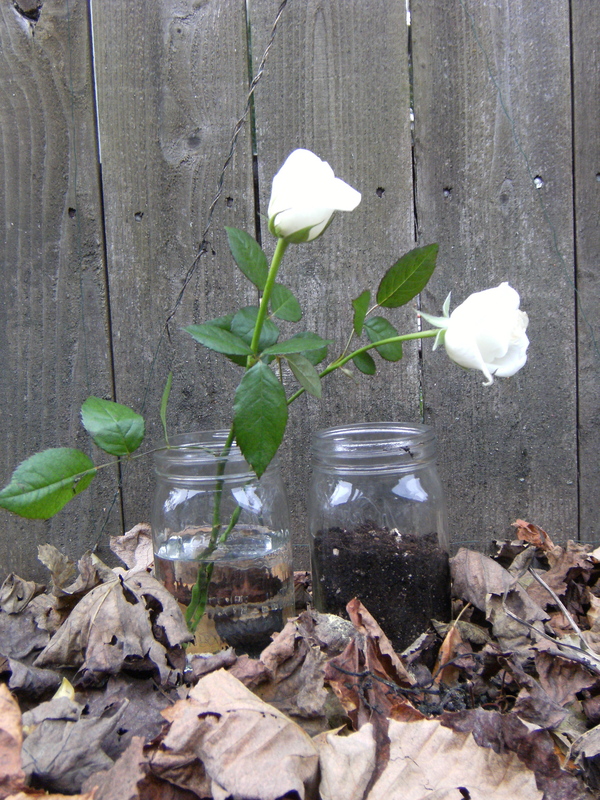 One jar is half-filled with water and holds two young, thorn-free, white rosebuds. While the other mason jar is half-filled with dirt. Both jars are surrounded by decaying leaves. In the background, is a weathered wooden fence with barbed wire. The two white, thorn-free rosebuds represent a relationship. All claws are retracted, as both roses have been trimmed of thorns; the two roses are symbolic of a new love experience where everyone involved puts their best foot forward and both parties exhibit their very best behavior to each other. I think of spring and summer when I see two young rosebuds. The mason jar that is half-filled with water represents the changing nature of emotions in any relationship. As the relationship develops and the roses age, the water will be depleted. This is symbolic of how much emotional energy must be expended for a relationship that has any depth or meaning. The jar that is half-filled with water also implies the optimism that accompanies new relationships. The mason jar that is filled with earth reminds us to be grounded even if we are floating for a while in the newness of a relationship. The earth is also fertile soil where new seeds (offspring) can be planted as the relationship continues. The decaying leaves that surround the jars speak of the change of seasons, after summer will come fall and then winter, as the relationship evolves. The barbed wire is reminiscent of rose thorns, that without a doubt will develop at some point, but there is time. As the water in the mason jar is depleted, a different type of emotional current will exist between the two roses as they learn to survive with less and have to rely on each other more. The wooden fence is symbolic of the solid energy that is needed in any relationship, whether that is a relationship with yourself or with another person. New Blood. The “honeymoon” period of a new romance. Two hearts, two souls, one path. Balancing feminine and masculine energy. New and exciting emotional developments. Making a connection. A calming and healing union. It’s as if I’ve always known you. A relationship of significance. One-to-one time. One-to-none time. Self love.